I have gotten a ton of emails over the last few months from people asking how to get the Wallpaper app to work correctly on their 1.1.3/1.1.4 (if you are on anything less than 1.1.3, please read the warning below). 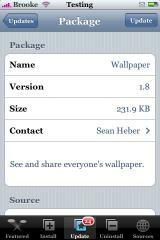 Well, no need for a symbolic link any more because Wallpaper version 1.8 makes the app compatible with 1.1.3 and 1.1.4. There are no visual changes to the app…the interface is the same. Wallpaper is available through the iApp-a-Day source. Below is the screenshot. Warning: If you are on a firmware lower than 1.1.3/1.1.4 version 1.8 of this app will not work for you…do not update quite yet…I bet we see an update soon! How do I delete the wallpapers? Where is it’s directory? You will need to go into your iPhone via SSH and the wallpapers are in the /Library/Wallpaper folder. If they are from the app Wallpaper they are listed as Wallpaper-import-1.png, Wallpaper-import-2.png and so on, just delete them from there. Make sure you delete the corresponding thumbnail too!! there r only installer,lockdwn ,preferences.